Pendulum EffectOnce per turn, when an attack is declared involving your face-up monster and an opponent’s monster, if you have an “Odd-Eyes” card in your other Pendulum Zone: You can make that monster you control gain 1200 ATK until the end of the Battle Phase (even if this card leaves the field). Monster EffectWhen this Pendulum Summoned card inflicts battle damage to your opponent by attacking: You can inflict damage to your opponent equal to the number of “Odd-Eyes” cards in your Pendulum Zones x 1200. You can only use this effect of “Odd-Eyes Phantom Dragon” once per turn. Odd-Eyes Phantom Dragon allows for an Odd-Eyes players to change ATK of their monster or do damage, depending on how they use OEPD. 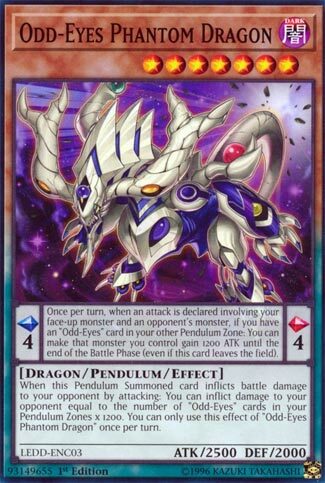 As a Pendulum, OEPD’s ability to raise an ATK by 1200 if you have another Odd-Eyes in your Pendulum Zone is a good way of getting over a monster. Once per turn prevents any abuse of raising the attack of any monster you control, forcing you to pick one. If you activate this effect and OEPD is destroyed in the Pendulum Zone, you still get the boost, which is good. As a monster, effect damage is a great addition to a monster. A max of 2400 damage can be done with OEPD’s effect as a monster if you have both zones occupied with other Odd-Eyes cards. However, only when OEPD is Pendulum Summoned can it do the effect damage. You could keep using OEPD as a link material, then Pendulum Summon it again in the same turn to do the damage. Solid stats and support as a monster, and it’s scale of 4 won’t hurt too badly as long as you can have a higher scale to accompany it (OEPD is Level 7 so you’ll need a higher scale to keep getting that burn effect). A nifty monster that can hit both ways for the Odd-Eyes archetype. Not great. Odd-Eyes Phantom Dragon is not a great Level 7 Dark Dragon-type Pendulum Monster with 2500 Atk and 2000 Def and horrible Scales of 4. This card is extremely limited to Odd-Eyes and cannot be played any where else. As a Scale, this let’s you pump a face up monster by 1200 Atk when battling a monster if it’s face up and if there is another Odd-Eyes card in the other Scale. So the effect cannot push when your opponent has no monsters, and it can’t even activate if you don’t have another Scale up. The monster effect is just as restrictive, giving Odd-Eyes Phantom Dragon a direct damage effect of 1200 multiplied by the number of Odd-Eyes cards in your Scales after it inflicts battle damage, and only after it was Pendulum Summoned. Tooooo restrictive on Twooooo effects, scary Phantom Dragon has a good name with no good legs to really stand on. Phantom Dragon is a scale 4, which is probably the worst scale possible if mixing it with Magicians, but you will likely see this in dedicated Odd-Eyes decks, not Magician Decks. In the scale, once a monster you control battles another monster your opponent controls, if you have an Odd-Eyes in your other scale, you can make your monster gain 1200 ATK. Solid boost, but you rather summon this over using it as a scale. For the monster effect, if a Pendulum Summoned Phantom Dragon (you are most likely Pendulum Summoning this) deals damage from an attack, you can deal 1200 damage for each Odd-Eyes in the scale. This is very easy, yet very heavy burn. In dedicated Odd-Eyes decks, you likely have two Odd-Eyes monsters in the scales, so 2400 damage on top of damage from a 2500 body will put a huge dent in your opponent’s life points. This is a hard once per turn, because otherwise that will be too much burn. Overall, the two effects of this card are great for getting some damage in. Though between him, Pendulum Dragon, and Arc Pendulum Dragon, he is the worst of the trio. That doesn’t mean don’t play him, each of the 3 I mentioned are staple in the Odd-Eyes Deck. Odd-Eyes Phantom Dragon. I’m not sure what, even in artwork, makes this a Phantom, but I press on. Weaker than yesterday, but still strong enough, even for Level 7, Phantom Dragon has 2500 attack. Lower on the Pendulum scale also, here being 4, as opposed to 8, like yesterday. This card is far more dependent on other cards, specifically in your Pendulum zone. But the effects on both sides are good here. You can use offensively or defensively for the 1200 attack bonus, or be widely setup and potentially do a whopping amount of Damage. 1200 Damage per Odd Eyes cards in your Pendulum Zone. This card is good too, not as game breaking or powerful as yesterday, but still good. Next articleShould You Wait to Buy a Nintendo Switch?